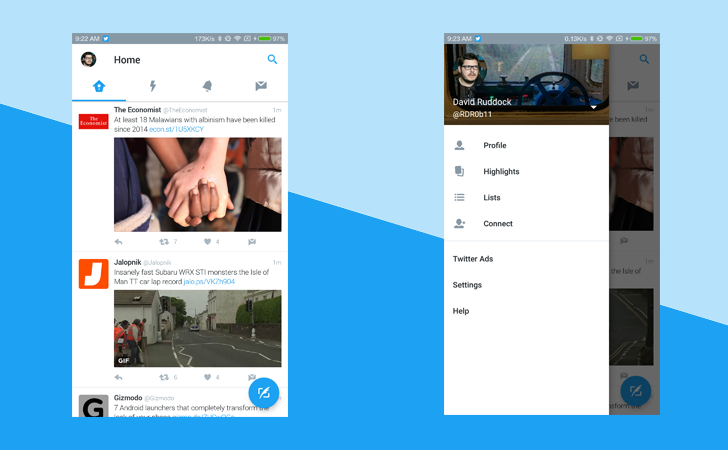 Twitter's much-awaited redesign for Android is finally here. Or, it will be, at some point today, and for everybody - at least that's what a post on Twitter's official blog says. The newly-designed app features a brand-new hamburger menu (minus hamburger icon), tabbed layout, and a compose tweet FAB. It is also responsive, hiding the header and search button area as you scroll through your feed. The new UI has been in testing with Twitter beta and alpha users for quite some time now, and appears to be the brainchild of former Falcon Pro developer Joaquim Vergès, who joined the Twitter team last summer.